The resulting sound-work was created by arranging the resulting 99 recordings in chronological order and alternating them in the left and right channels. Spectral analysis was then used to determine the most common frequencies, these frequencies were then exaggerated through digital processing to produce the final piece. 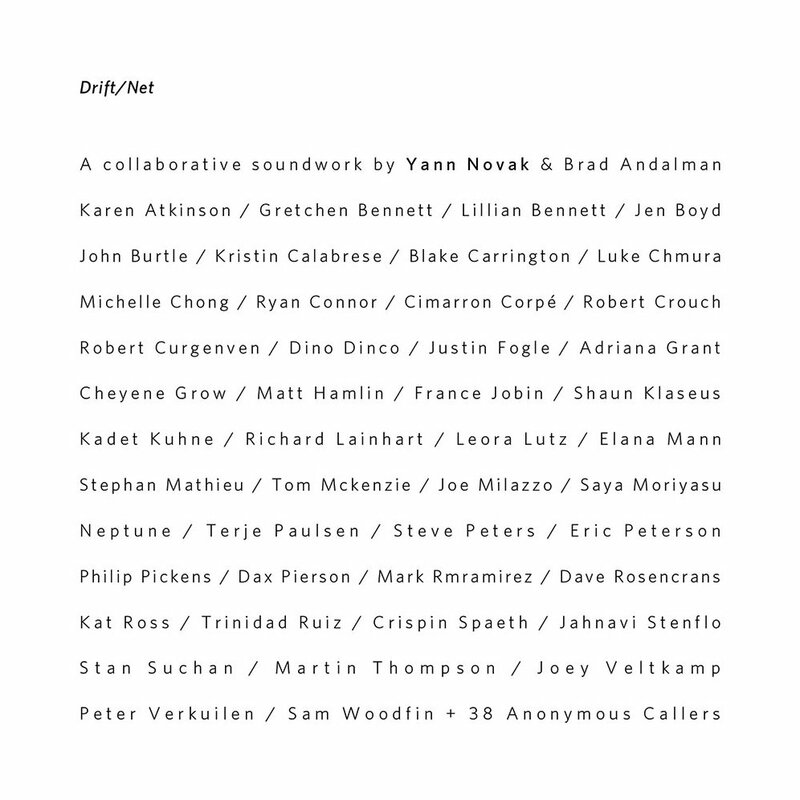 Collaborators: Brad Andalman, Karen Atkinson, Gretchen Bennett, Lillian Bennett, Jen Boyd, John Burtle, Kristin Calabrese, Blake Carrington, Luke Chmura, Michelle Chong, Ryan Connor, Cimarron Corpé, Robert Crouch, Robert Curgenven, Dino Dinco, Justin Fogle, Adriana Grant, Cheyene Grow, Matt Hamlin, France Jobin, Shaun Klaseus, Kadet Kuhne, Richard Lainhart, Leora Lutz, Elana Mann, Stephan Mathieu, Tom Mckenzie, Joe Milazzo, Saya Moriyasu, Neptune, Terje Paulsen, Steve Peters, Eric Peterson, Philip Pickens, Dax Pierson, Mark Rmramirez, Dave Rosencrans, Kat Ross, Trinidad Ruiz, Crispin Spaeth, Jahnavi Stenflo, Stan Suchan, Martin Thompson, Joey Veltkamp, Peter Verkuilen, Sam Woodfin & 38 anonymous callers.